Chocolate Cake. That is all. Ok ok, we obviously cannot stop there! 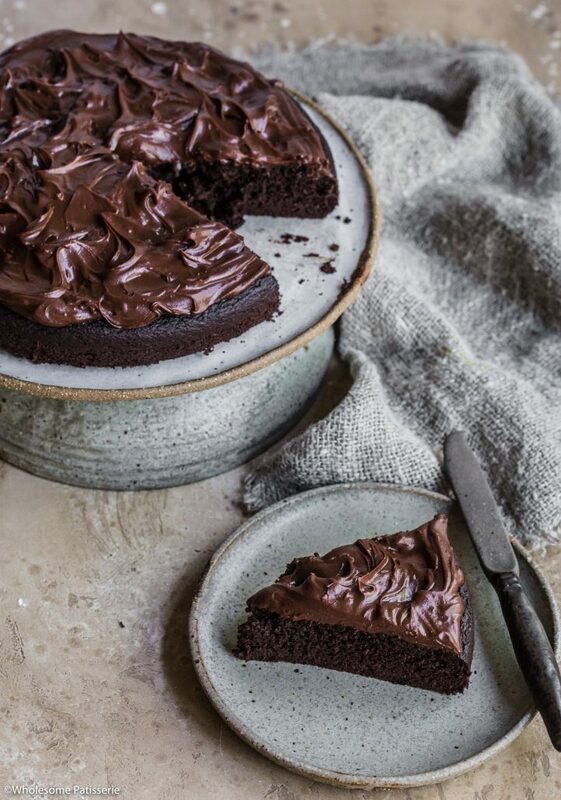 Rich Chocolate Ganache Cake! Made gluten & dairy free – YES! Are you looking at this frosting right now? 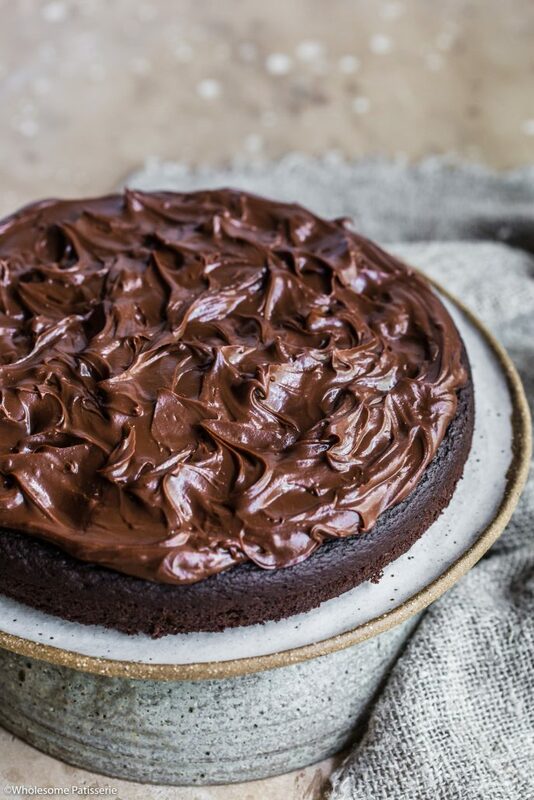 It’s coconut cream chocolate ganache and I think I have just made a decision that it’s the ONLY frosting you need in your life when it comes to cake and cupcakes. Have I ever told you that I don’t like making buttercream frosting? Well I don’t, to be honest, it bores me and is so repetitive. I know many things are but if I had another equally great frosting option, I will take it each and every time! Guess what? We now do! Chocolate Ganache! Not sure why I didn’t come to that realisation earlier….. Anyway! 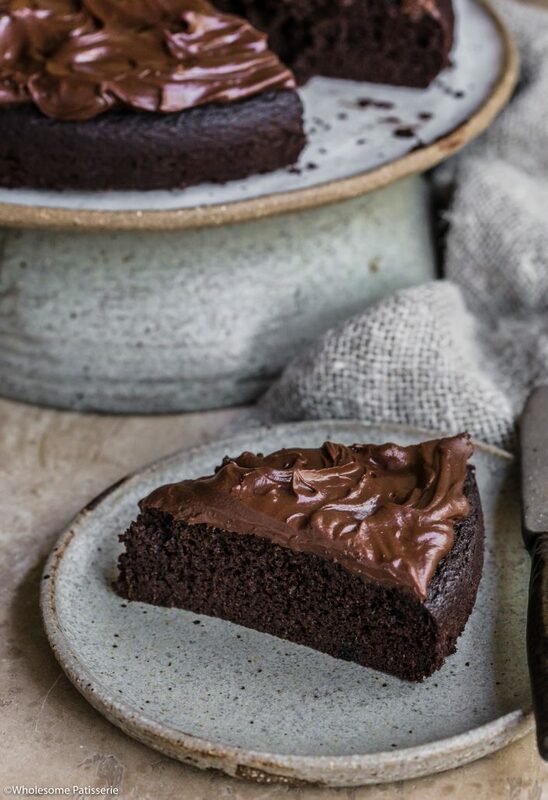 This glorious chocolate cake is 100% gluten free and dairy free, woohoo! It does how ever contain eggs so it’s not completely vegan. If you wish to experiment with a flax egg, I would love to know how you go as I have not yet tried it myself. I’m afraid it will alter the texture a little too much. 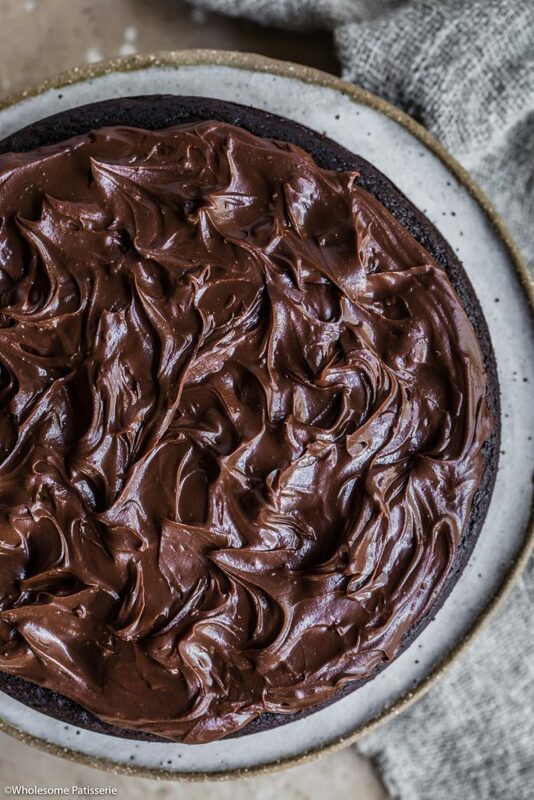 Best of all, you won’t need an electric beater or stand mixer to make the cake and the ganache. The cake is made using only 2 bowls and a whisk. The ganache is created by warming your coconut cream on the stove top then pouring it over your broken up chocolate in a bowl. Let it sit to melt the chocolate, mix it good and let it sit for at least a couple of hours to get even thicker! 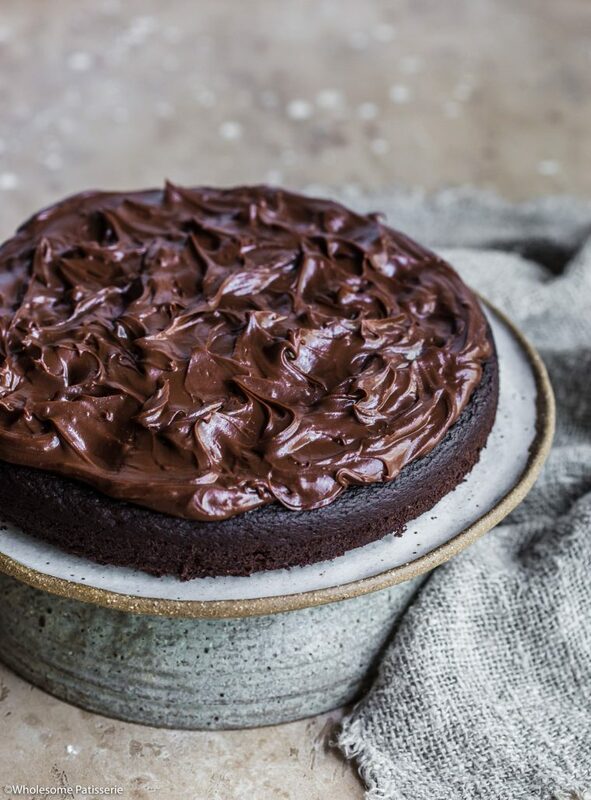 You’ll then have luscious, thick and gorgeous dark chocolate ganache in readiness to frost your waiting freshly baked cake! Ready, set, LET’S GET BAKING! Watch how to make this delicious cake! Preheat oven to 180ºC (356ºF) and line a 9” round springform cake tin with parchment paper, this will create a thinner cake. Or line a 7” round cake tin with parchment paper for a taller cake. In a large bowl whisk together milk and coffee until coffee has completely dissolved. In a separate medium bowl, whisk flour, almond meal, cocoa, baking powder, baking soda and salt. Gradually add the flour mixture into the milk mixture, whisk until well combined and smooth, approx. 10-15 seconds. Pour cake batter into lined tin. Bake for 18-20 minutes or until the top bounces back when lightly pressed or a toothpick inserted into the middle comes out clean. Cool cake in tin for 10 minutes. Transfer cake to a wire cooling rack to cool completely. Break chocolate down into squares and place into a small heat-proof bowl. Pour cream into a small pot and gently warm over a low heat. Heat cream until warm and small bubbles begin to appear around the edges, do not let it come to a boil. Remove from heat. Pour warm cream over chocolate and let sit for 5 minutes. Gently stir chocolate into warm cream until well combined and smooth. Set aside at room temperature for 30 minutes - 1 hour until thickened. NOTE: set ganache in the refrigerator to fasten up the process. Keep an eye on it as it can firm up quickly. Either method works. 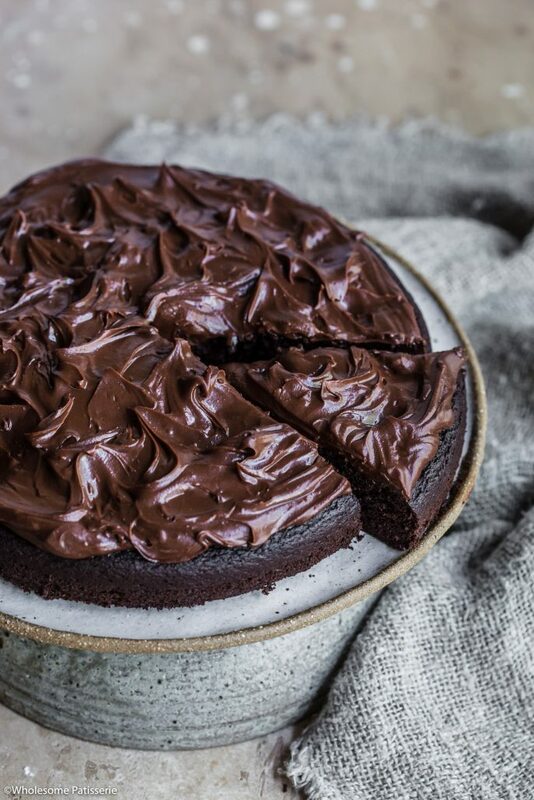 Once cake has completely cooled, spread thickened ganache over the top. Store cake in an airtight container, in the pantry, for 4-5 days. You may also store it in the refrigerator but the ganache frosting will harden. What other flour can be used if there is a nut allergy?